The crackdown in Egypt has intensified over recent weeks, with the arrests of human rights activists and the passing of repressive new ‘anti-terror’ laws. The new legislation has been condemned by Human Rights Watch, which described it as “a big step toward enshrining a permanent state of emergency,” and Amnesty International, which said it would effectively ban the rights to freedom of expression, peaceful assembly and association. Unfortunately, the new laws, which give even greater powers to the military and police, haven’t come out of nowhere. They are all too typical and consistent with the authoritarian rule of the Sisi regime and the Egyptian authorities. In August 2013, following the overthrow of the Morsi government, the Egyptian military, led by Sisi in his capacity as then-defence minister, killed over 1000 activists. 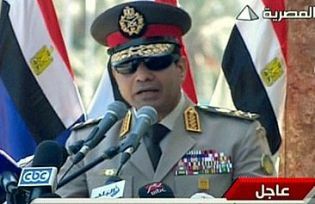 The killings, which three quarters of Egyptians blame on Sisi himself, established the oppressive rule of the military. This was followed by what Amnesty International has described as “a surge in arbitrary arrests, detentions and harrowing incidents of torture and deaths in police custody” and a corrupt ‘election’ in which Sisi ‘won’ the presidency with over 96 percent of the vote. The military coup and its aftermath was condemned by the international community, with the US calling for an end to the attacks and cancelling joint military operations. They were joined by the UN Secretary General who called for a restoration of democracy and an end to the violence. Countries like the UK followed suit, with David Cameron calling for a “genuine democratic transition” to take place. The tough talk was followed by the announcement of an EU arms embargo, but it was a lot weaker than the lofty rhetoric suggested. The embargo called for member states to suspend licences for arms that may be used for internal repression and to re-assess export licences for military equipment and review their security assistance to Egypt. However, the so-called embargo was not legally binding and was left open to the interpretation of individual states. There were no time limits on the restrictions, and nor did it have any clear definitions for what it meant by the terms “suspension” or “equipment, which might be used for internal repression”. Almost inevitably it was ignored, with arms sales resuming almost as soon as the attacks were out of the media (a case of what some activists call “arms control by embarrassment.”) If we are to look at the UK as an example then it becomes clear how weak and ineffective the embargo was. In August 2013, the UK suspended 49 licences for arms to Egypt. However, only two months later 24 of these suspensions were lifted, with only seven being fully revoked and arms sales resuming almost straight away. The US had announced its own embargo, which was a bit stronger, but was also very quickly diluted. Within nine months the government was back to exporting Apache helicopters to the regime, and nine months after that it announced that its embargo was being scrapped altogether, with $1.3 billion worth of arms being authorised on the same day. The rhetoric about human rights has continued, but actions speak louder than words. In February 2015 France announced that it had confirmed the sale of €5 billion worth of fighter jets to Egypt. Similarly, the UK was back to licensing big ticket items; with over £40 million worth of components for military combat vehicles in March 2015. Since then Egyptian military representatives have attended the UK’s Security and Policing arms fair at the invitation of the UK government, and David Cameron has invited Sisi for talks in London later this year. Egyptian representatives are also likely to be in attendance at DSEI, the world’s biggest arms fair, when it takes place in London next month. It has been two years since the Egyptian crackdown began, and the chances of anybody being held responsible for the crimes and abuses that have taken place look very slim. Both the Egyptian government and the International Criminal Court have refused to investigate them and there is little international pressure for them to do so. In theory Egypt is supposed to be hosting parliamentary elections later this year, although they have already been suspended from their original date in March and, if the 2014 ‘election’ that cemented Sisi’s rule is anything to go by, they are unlikely to be free or fair. Recent months have seen a rise in activity from ISIS and other extremist organisations, with one car bomb wounding 29. The likely response will be even greater repression and the further consolidation of Sisi’s rule. Of course the issue goes wider than Egypt. This is only the most recent manifestation of the hypocrisy that lies at the heart of western foreign policy. Ultimately politics is about choices. It is impossible to show solidarity with the people of Egypt at the same time as arming and supporting the tyranny that is oppressing them. The first step has to be an end to arms sales to the regime and an end to the political support bolstering it. The uprisings of 2011 were fuelled by a desire for human rights and democracy, a desire that has not gone away, but that is being suppressed by a cruel, authoritarian government and ignored by those propping them up.